BlueTEC SUV handles everything a family can throw at it. For many of us we’ll face two major purchase decisions in our lifetimes: buying a home and a vehicle. And no matter how many times we kick the tires, inspect the foundation or consult with the neighbours, we all inevitably end up in the same place prior to signing on the dotted line (or not): what will our lives look like in it. The kicker is you never know if you’ve made the right decision until you take the plunge. Unless, of course, you get to put it through its paces first. The ultimate test drive, so to speak. 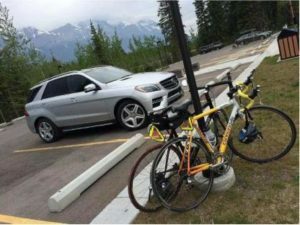 It’s Wednesday and I head into the showroom at Lone Star Mercedes-­Benz in Calgary where Simon Clarke, the dealership’s General Sales Manager, meets me. He takes me for a brief tour of the facility — from the service drop-off and customer waiting areas to the pre-owned centre and back-lot car wash. It’s a process every new buyer experiences at the dealership. We’re then met by Audrie Rogado in the delivery bay where the ML350 sits, polished and poised for action. Instead of handing over the keys right away, Rogado, a delivery specialist at the dealership, walks me through the vehicle’s feature’s like a proud father listing off his child’s accomplishments — again, a process every new customer goes through. It’s the little things that excite us: climate-comfort (cooled and heated) front seats, cooled and heated cup holders, a pop-out rear-view camera (that won’t get dirty!) and a multi-purpose key fob that would make James Bond’s Q blush. As I take to the street for my first solo flight, the ML manoeuvres in and out of traffic with ease thanks to its Airmatic suspension with adaptive damping system. The all-in-one Command control dial is also surprisingly intuitive. Within minutes, I’ve synced up my phone, navigated through the Sirius satellite radio and activated the very-cool 3D navigation option. My first stop is the grocery store – a true test for any five-passenger vehicle of mine. Where many in the past have failed, the M-Class thrives, easily accommodating everything. At home, the Mercedes looks as good in the driveway as it does on the road. The kids are excited, as are the inquisitive neighbours. I can’t help but sneak a smile at the “Jones’s” not-so-subtle envious line of questioning. If I owned the ML350, I’d be 20 pounds lighter. No, it doesn’t have a built-in ab machine — but don’t count that out in the future, especially since both the driver and passenger seats already include a massage feature. Instead, it’s the lifestyle the M encourages. It begs to be driven, and I’m all too happy to oblige with a trip to the nearby Rockies for an afternoon of cycling. Co-worker Brian and myself take the afternoon off, load the bikes into the back (an easy feat thanks to more than 2,000 litres of trunk capacity with the rear seats folded flat; not to take away from the vehicle’s 3,265-kilogram towing capacity) and set our sights on the Legacy Trail between Canmore and Banff. It’s on the Trans-Canada Highway that the M-Class excels in both comfort and performance. Like most Mercedes-Benz vehicles, the M’s interior is extremely well appointed. Seven-way adjustable leather seats, panoramic sunroof and dual climate control (tri if you include the rear seats) turns a road trip into a day at the spa. Thanks to its 240-horsepower V6 DOCH engine, performance is impressive for a vehicle that, while lighter than its previous incarnation, still tips the scales at more than 2,200 kilograms. Mercedes-Benz officially clocks the M-Class’s zero to 60 m.p.h. time at 7.4 seconds; we come short at 9.5 seconds, yet are blown away by its torque at mid and high speeds — a handy feature when passing through the mountains. The drive also lets us see if the diesel-powered Bluetec engine sounds like the diesels of old: two clanging spoons. Yet with barely a whisper, the M-Class is as quiet as most anything its size on the road — helped along by a well-insulated cabin. I’m awakened by the girls who are acting like it’s Christmas morning, asking if we could take the new car out today. We drop them off at school (cue the curious looks from fellow moms and dads) and I take advantage of a surprisingly enjoyable rush-hour commute. At work, it’s an easy fit in the parking lot, which, at times, can even challenge my Mini Cooper-driving colleagues. In the evening the M-Class handles daycare pickup, dance practice drop-off and carpooling like a champ. It’s in these crowded parking lots that I appreciate the 360-degree-view camera when backing up. The bird’s-eye view takes some getting used to, but becomes as easy to navigate as the rest of the vehicle’s features. It’s off to Waterton Lakes National Park for the weekend, with the family (and the dog). Cargo space again easily handles the load. The trip down Highway 2A allows me to put some of the M-Class’ safety features to the test, notably Active Lane-Keeping Assist, Passive Blind Spot Assist and the radar-based Distronic Plus proximity control. The lane-keeping assist notes I’m gradually leaving the lane by vibrating the steering wheel, followed by a gentle readjustment back into the lane – nothing too intrusive. Distronic Plus, meanwhile, is Mercedes-Benz’s version of cruise control that adapts on the road as you approach vehicles by applying integrated brake assist. While a bit conservative for my liking, it is easily one of my wife’s favourite features (along with the massaging passenger seat!). 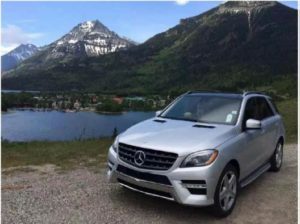 After returning from a sweaty hike on the trails in Waterton, the M­Class’s advanced key fob is much appreciated as it rolls down all windows before we reach the vehicle. This is perhaps the saddest day of the journey, as it’s when I return the ML350. The final tally after five days includes two road trips, numerous daddy duties and barely one tank of gas despite more than 1,000 kilometres added to the odometer. From highways to driveways and groceries to grand entrances, I reflect on that all-too familiar question as I pull up to a grinning Rogado: Did it fit my life? What’s new in the 2019 C-Class? Fashion Forward 2018 was a smashing success!